HJ: We all have a destiny, but that does not mean that our life is predetermined. Our destiny is essentially our highest potential — our highest expression of ourself in a given lifetime. It is what we always being called to express — that persistent nudging of spirit. We can choose to step into this role or hide it from it by distracting ourselves with any number of mundane, illusory things as the vast majority of humanity chooses to do. The easiest way to draw the analogy is by using prominent historical leaders and figures. Einstein, Ghandi, Martin Luther King Jr., John Lennon, Krishnamurti and so on… these souls had all reached their highest potential in their lifetimes. We all have this potential within us — it is our birthright, our destiny. Now, not everyone will be a leader on the world stage, but in our own way, we are destined to shape and transform the world by simply expressing our true selves in the deepest sense. That may seem like a tall order, but it is entirely possible. However, it calls for an incredible journey of realization, self-inquiry and discipline, which most shy away from for fear of success and failure simultaneously. It need not be this way. The are many guideposts along the path of self-realization and expression that can help one navigate and overcome nearly any challenge or circumstance which may present itself. Offered below are 11 keys to manifesting your highest potential — your destiny, if you will. Now, this is not a list of fundamentals, but rather a very advanced, higher density guide based primarily on metaphysical concepts. We’re first always seeking to manifest the version of ourselves capable of existing along the timeline we wish to access. In a sense, we’re not truly creating or manifesting reality, but aligning with a timeline that already exists parallel to our present moment. When you reach toward your highest potentials, you allow the “you” most strongly aligned with the timeline where your vision exists to transport you there. We offer here some steps you can follow to align with your highest potentials. Once you receive a vision and choose to align with it, next begin the process of cultivating and strengthening the aspect of your consciousness most closely aligned with your vision. This is the aspect capable of bringing your creation into being. The fact that you are reading this says that you’re interested in existing along high-vibrational, fifth-dimensional timelines and have set your intentions to manifest the “you” capable of helping you step more fully into the new time. This “you” represent your highest potentials. When we become the version of ourselves that is able to take us in the direction of our highest potentials, this self will always find a way to access higher frequencies within each moment. Three) Allow your new vision to simply exist in consciousness. Do not concern yourself in this early stage with how you will bring this vision into your physical reality. When a new vision arrives in the doorway of our imagination, all we need do is open to it and welcome it as a potential. We do not have to know how we will carry out the vision in order to open to it and allow it to exist as a strong potential in consciousness. It is a misunderstanding to think that we can only carry out those visions we are skilled and experienced in carrying out. This is yet another version of the scarcity thought virus that tells us we do not have what we need to carry out a vision so we must disregard it as yet another “daydream” delivered up by our fanciful imagination. Five) As a new potential gathers strength in its energetic field, you may become aware of pockets of resistance that exist within you. Generally speaking, these are not aspects that want to hold you back, but rather, aspects that exist within past moments where unhealed and unresolved emotions and their accompanying traumas reside. These aspects are holding energy to “bookmark” this moment in time so a future, more masterful “you” can return to heal and release them. As we cultivate and prepare to activate new potentials, we are shown any areas that need healing and release. As we free energy being held around past traumas, we’re able to refocus this energy toward new potentials we wish to activate. Seven) Allow the universe to bring new realities to you in whatever way it can. It is a mistake to place contingencies on how realities arrive. Some believe they must first manifest a sum of money in order to realize their higher visions. This is a misunderstanding. Placing contingencies and prerequisites on our creations only serves to bottleneck and slow their arrival in physical reality. For example, if you wish to undertake a spiritual pilgrimage around the world, focus on this desire rather than the money needed to make it happen. It’s easy to see how a vision of your journey is far more exciting to your higher self than a pile of money which by comparison is abstract and may hold connotations of meaningless work and enslavement. When you set an intention and remain awake and aware to clues and information in your daily life, you will find the bread crumb trail that leads to your desired creation. Eight) Remain alert to the voices in your head that tell you that your dreams are impossible and unrealistic. These are the voices of thought viruses you were indoctrinated to in childhood and through collective consciousness. Your higher self will never tell you that you’re not able to live your dreams. Likewise, your intuition will never bring you dreams and visions of potentials that are not real and true for you. Don’t allow yourself to be hamstrung by thought viruses that say you’re not ready or good enough or empowered enough or enlightened enough to live your visions. You can wire around these disempowering voices by choosing to align with the highest vibrational frequency you’re able to access within the present moment and move on from there. Nine) Release overinvestment in physical reality. Hold in awareness that the reality you see around you in your present moment represents past creations and is fluid and changeable. Don’t be fooled by the solid, concrete appearance of “reality.” When we look at these seemingly solid and immovable structures of our present moment, we may feel powerless to change them. It’s true we cannot change an existing timeline. But we can shift to a new timeline. In order to change our reality and the timeline we exist along, we must go within to align our visions and intentions with subtle energy. Creating is not a matter of moving concrete around but of aligning ourselves with the reality we wish to experience at the subtle level where raw energy is shaped by intention, and allowing ourselves to be transported energetically to the timeline where that reality already exists. Ten) Align with the identity of one who is living the reality you wish to create. 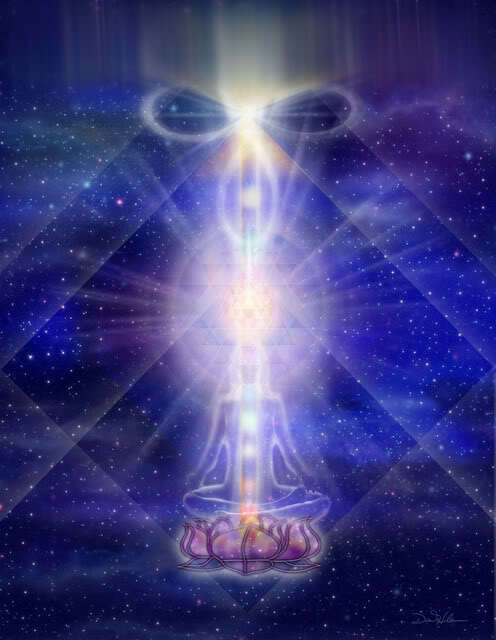 When you receive a vision of a new potential, there’s always an aspect of your consciousness that is able to nurture this vision into physical reality and transport you to the timeline where this new potential exists. As you energize and nurture a new potential, it will teach you who you need to become in order to carry it out to the world. In this way, you learn the identity of this aspect of your consciousness and begin to align with and adopt it as your new focus self. If you have become overly invested in your present-moment focus self, you will need to work with your higher self which can teach your present focus self to embrace the concept of service, impermanence and transcendence. As your focus self learns to act in service to the highest good of all, it will step aside when the time comes to alow a new facet of your consciousness to become the focus identity self capable of transporting you to timelines where new potentials exist. Eleven) Refrain from judging yourself as moments from your past come before you to be released. Everything you created/activated in the past was designed to help you learn to grow and become the wise and empowered “you” that exists within your present moment.